There are many cases where a system is not closed but maintains constant angular momentum. When a merry-go-round is running at constant angular momentum, the engine's torque is being canceled by the torque due to friction. 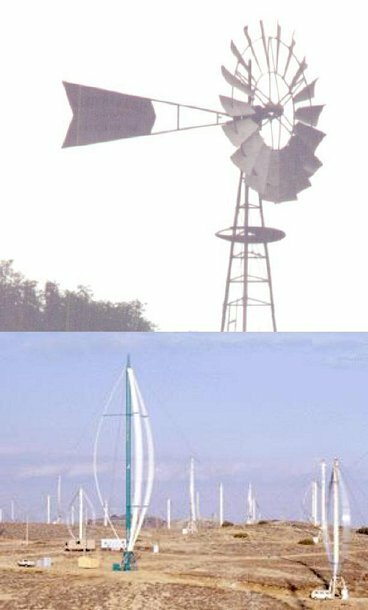 The windmills are not closed systems, but angular momentum is being transferred out of them at the same rate it is transferred in, resulting in constant angular momentum. To get an idea of the huge scale of the modern windmill farm, note the sizes of the trucks and trailers. When an object has constant momentum and constant angular momentum, we say that it is in equilibrium. This is a scientific redefinition of the common English word, since in ordinary speech nobody would describe a car spinning out on an icy road as being in equilibrium. Very commonly, however, we are interested in cases where an object is not only in equilibrium but also at rest, and this corresponds more closely to the usual meaning of the word. Trees and bridges have been designed by evolution and engineers to stay at rest, and to do so they must have not just zero total force acting on them but zero total torque. It is not enough that they don't fall down, they also must not tip over. Statics is the branch of physics concerned with problems such as these. You know the behaviors of the various types of forces, for example that a frictional force is always parallel to the surface of contact. You know about vector addition of forces. It is the vector sum of the forces that must equal zero to produce equilibrium. You know about torque. The total torque acting on an object must be zero if it is to be in equilibrium. You know that the choice of axis is arbitrary, so you can make a choice of axis that makes the problem easy to solve. In general, this type of problem could involve four equations in four unknowns: three equations that say the force components add up to zero, and one equation that says the total torque is zero. Most cases you'll encounter will not be this complicated. In the following example, only the equation for zero total torque is required in order to get an answer. A pencil balanced upright on its tip could theoretically be in equilibrium, but even if it was initially perfectly balanced, it would topple in response to the first air current or vibration from a passing truck. The pencil can be put in equilibrium, but not in stable equilibrium. The things around us that we really do see staying still are all in stable equilibrium. Why is one equilibrium stable and another unstable? Try pushing your own nose to the left or the right. If you push it a millimeter to the left, it responds with a gentle force to the right. If you push it a centimeter to the left, its force on your finger becomes much stronger. The defining characteristic of a stable equilibrium is that the farther the object is moved away from equilibrium, the stronger the force is that tries to bring it back. The opposite is true for an unstable equilibrium. In the top figure, the ball resting on the round hill theoretically has zero total force on it when it is exactly at the top. But in reality the total force will not be exactly zero, and the ball will begin to move off to one side. Once it has moved, the net force on the ball is greater than it was, and it accelerates more rapidly. In an unstable equilibrium, the farther the object gets from equilibrium, the stronger the force that pushes it farther from equilibrium. The dancer's equilibrium is unstable. If she didn't constantly make tiny adjustments, she would tip over. This idea can be rephrased in terms of energy. The difference between the stable and unstable equilibria shown in figure v is that in the stable equilibrium, the potential energy is at a minimum, and moving to either side of equilibrium will increase it, whereas the unstable equilibrium represents a maximum. Note that we are using the term stable in a weaker sense than in ordinary speech. A domino standing upright is stable in the sense we are using, since it will not spontaneously fall over in response to a sneeze from across the room or the vibration from a passing truck. We would only call it unstable in the technical sense if it could be toppled by any force, no matter how small. In everyday usage, of course, it would be considered unstable, since the force required to topple it is so small.